Aahh, meat. Sometimes I love the stuff. Sometimes I go weeks feeling completely ambivalent about it. Sometimes I read depressing articles and the thought of meat consumption makes me feel sick. Sometimes I eat Iranian food and remember just how beautiful meat really is. How could I ever have thought otherwise?? Those Persians know how to treat meat right. 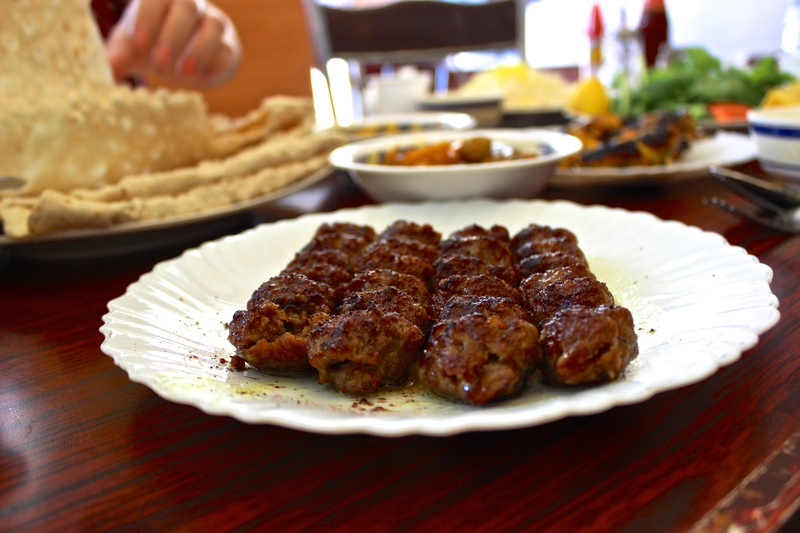 You haven’t experienced tender meat till you’ve had a good Iranian kebab. So I was excited to spot Shamsuddin on Satwa Road recently. It’s pretty bare bones, but that’s just the way I like it. Basic furniture. Tissue boxes. TV on the news channel. Two guys running the whole place. 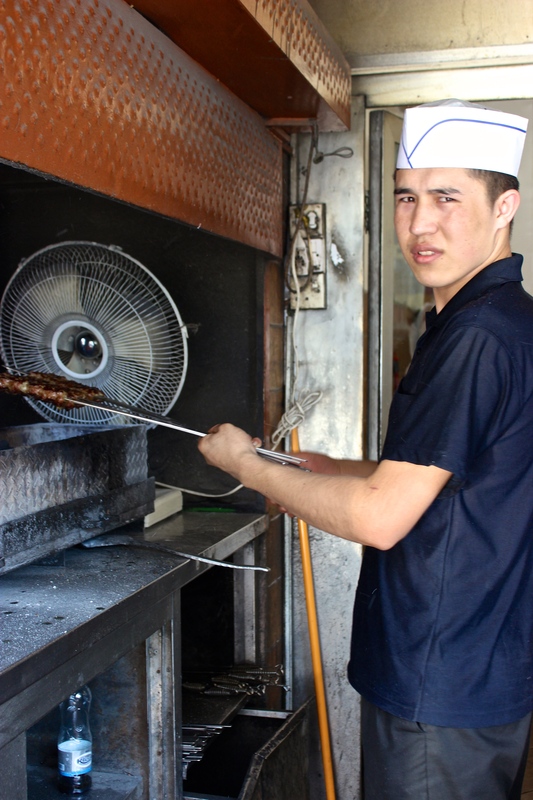 The guy working the grill must have been someone’s son, a baby-faced meat apprentice. Shamsuddin don’t even have a menu. Just decide if you want mutton or chicken, minced or pieces. Simple as that. The rest will come to you. In the face of such choices, we ordered a plate of everything. A housemade laban, heavy on the fresh mint, kept our tastebuds happy while waiting, the aroma of grilled meat wafting through the room. The gruff waiter drops small bowls of dal and vegetable curry on the table, with fresh green salad, and a raita each. This is the important thing I’ve come to learn about Iranian food – at first you think it’s just meat. But when you order a mutton kebab, there are all these different elements that come with it. You build each bite differently – a slice of onion, a dollop of minty raita, a spoonful of dal. Pick it up with lavash flatbread, or scoop it with some buttery saffron rice. The simple things make for the most satisfying feast. Someone’s go to explain to me how Iranians get their meat so damn tender. Sumac-sprinkled chelow kebab, which was minced meat in this case, was buttery soft to the point of ridiculousness. What’s going on here? What kind of sorcery? 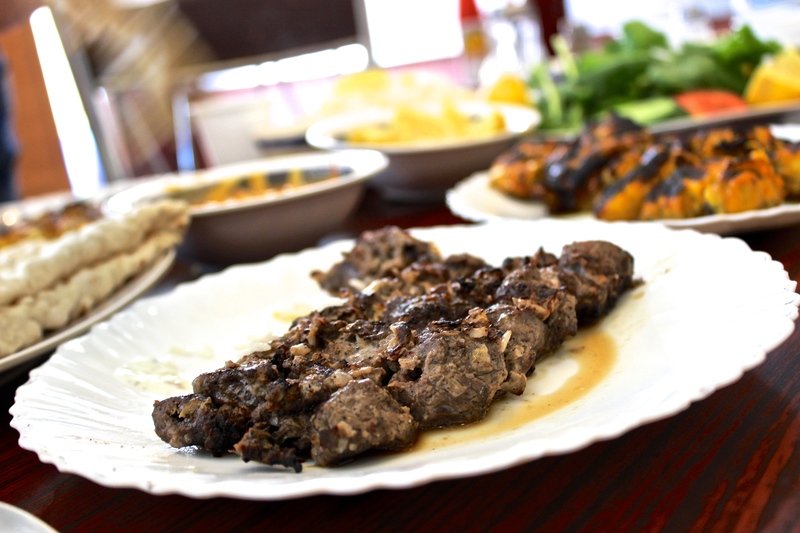 Mutton chunks, marinated in sour lemon, continued the meat odyssey with aplomb. 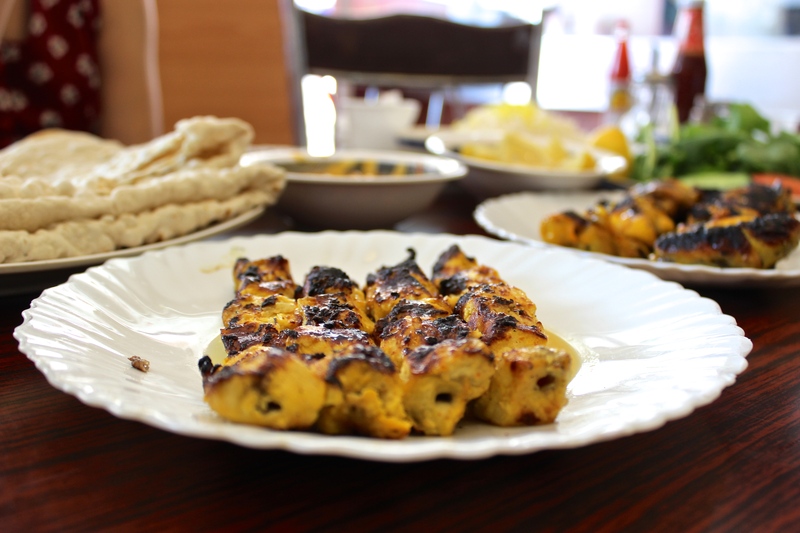 The chicken kebab – or jujeh kebab to give it’s real name – comes in tender boneless nuggets, or a neat row of skewered wings and thigh chunks. 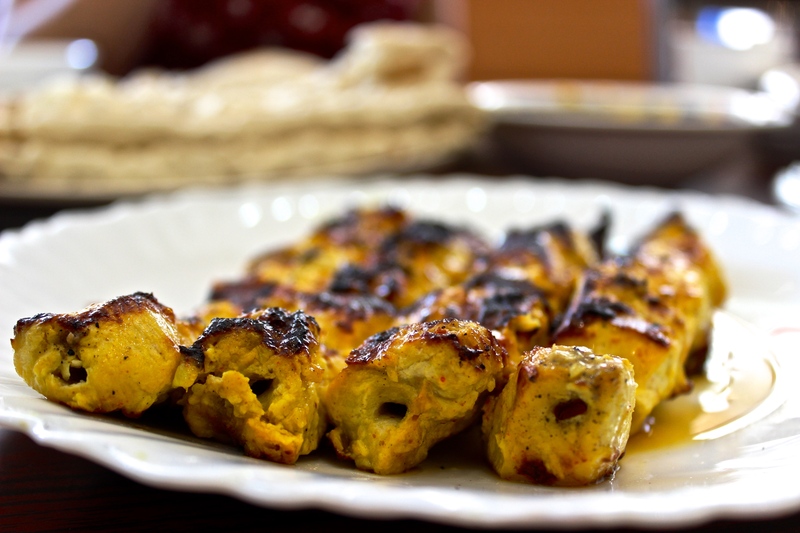 The vibrantly yellow marinade is mild yet moreish, and soaked through to the bones. That beautiful char adds a smokiness I can’t get enough of. 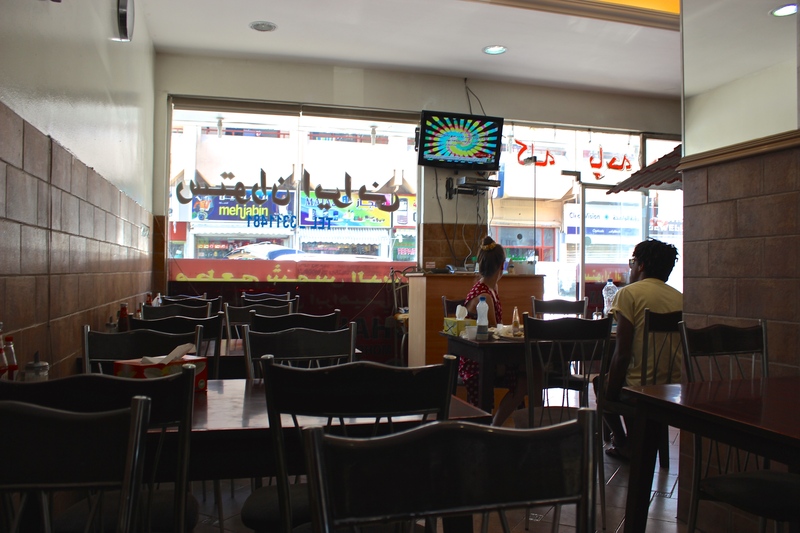 Whenever I see chefs and restaurants talking hot air about “rustic” dishes, I want to take them to a place like Shamsuddin.This is an old-school establishment, grilling skewered chunks of meat the way it’s been done for centuries. If anything’s “rustic”, it’s this. Shamsuddin didn’t take me to the highest heights of meat ecstasy that other Iranian restaurants have (namely one in Global Village, if you can believe it). But if you’re in the mood for some tasy, affordable grilled meat, these guys have got your back! More about I’m not a fiend on our contributors page and here. Next PostMoon River and Buffalo 66 – what is it about Vincent Gallo?